New Contest! Leave a Comment to Win "The Smoking Gun: A Dossier of Secret, Surprising, and Salacious Documents"
Well, it's time to do it again! THE PRIZE: A copy of The Smoking Gun: A Dossier of Secret, Surprising, and Salacious Documents. "From the creators of the highly popular website, The Smoking Gun, a wildly entertaining collection of previously unpublished documents (court transcripts, FBI files, morgue and police reports, etc.) that hilariously illuminate some of the most important, scandalous, or bizarre news stories of recent years." THE RULES: Leave a comment—any comment—by Monday, August 24, 2009, 11:59 p.m. If you don't have an ID you can sign in with, you can comment anonymously and leave your name or your initials; when I announce the winner, you'll know if you won and all you have to do is e-mail me to claim your prize. I'll put all the names in a bowl or something, and one winner will be chosen at random. Anyone in the world can enter, even those people who have won before. BAMBOO NATION: New Contest! 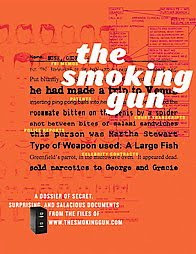 Leave a Comment to Win "The Smoking Gun: A Dossier of Secret, Surprising, and Salacious Documents"